New Westminster, B.C. – January 19, 2019 – Kim Novak is the new President of UFCW Canada Local 1518, following an election held by the Local Union’s Executive Board. Patrick Johnson has also been unanimously elected as Secretary-Treasurer by the Executive Board. 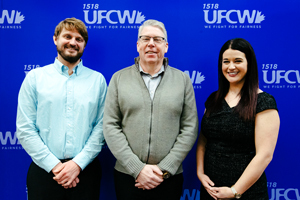 At a recent ceremony led by UFCW Canada National President Paul Meinema, Kim Novak was sworn in as President of UFCW 1518, stepping into the position vacated when Ivan Limpright retired last month after 34 years of service. Novak swore her oath to uphold the Local Union’s constitution, as well as the values of the labour movement. Patrick Johnson was also sworn in as Secretary-Treasurer at the ceremony. “It is a great privilege to be elected to work on behalf of UFCW 1518 members. I’m looking forward to continuing to build the union’s power, both financially and politically,” said Johnson. Prior to being elected President of UFCW 1518, Novak was hired as a summer student working in the Communications Department in 2007. Soon she was offered full-time employment and moved up the ranks from Union Representative to Director, and in 2015 she became Secretary-Treasurer of the local. A lifelong activist, Patrick Johnson has been organizing non-unionized workers with UFCW 1518 since 2010. He served as Executive Assistant until his election as Secretary-Treasurer this month. UFCW 1518 President Kim Novak and Secretary-Treasurer Patrick Johnson are passionate about the work of the labour movement and advocating for the rights of members. They bring a strong commitment to member engagement, education, and empowerment that is already being realized in the Local’s training sessions and steward appreciation events. To read more about the new leaders at UFCW 1518, click here.